Wondering how your iPad project can integrate with the curriculum? We’ve got that covered with Apple Curriculum Support. At Sync we help you develop an effective curriculum integration and tailored CPD strategy to ensure the seamless introduction and ultimate success of your iPad learning project. 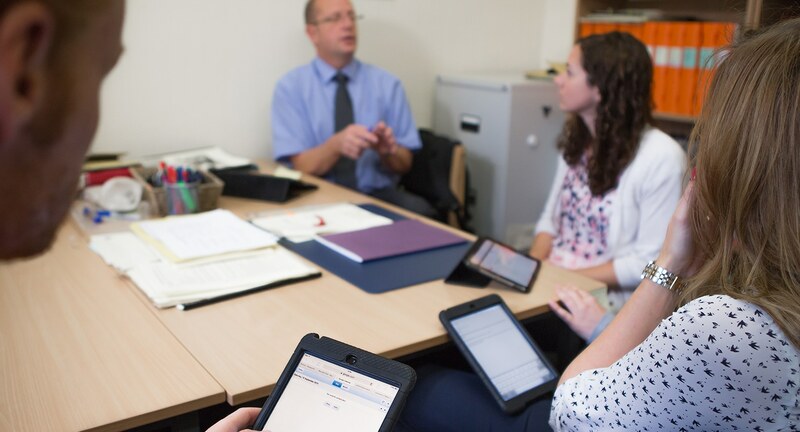 Our Curriculum Mentor programme helps schools successfully embed iPad technology into everyday school practices, while our CPD programme ensures all teaching staff can learn and develop their own skills alongside their students. First thing’s first: we need to immerse ourselves in your school’s direction and unique vision for learning before we can strategise your CPD programme. We’ll set up an in-depth immersion and onboarding meeting so we can work together to identify your main areas of focus, your measurements for success and how you see Apple technology playing its role in your school. Next, it’s time to start your curriculum integration programme. This will entail close collaboration with your Key Stage and Subject Leads, where we will help map out your curriculum and identify all the most beneficial opportunities for integrating iPad technology. This can work wonders for the most problematic subject areas where students are consistently struggling to engage and develop. Experience has shown us that CPD strategies are most effective when delivered right where it matters; in the classroom. Let us introduce you to our Modelled Lessons initiative, which involves Sync teachers delivering classroom lessons to your students while you observe and support. Detailed lesson plans and resources will all be shared with staff, with the ultimate aim of transitioning control of lessons to your staff while Sync teachers support, observe and provide valuable feedback. Contact the education team at Sync to get started with our CPD and Curriculum Integration scheme.